How do you feel about purses? I know that's a strange question ... but it's been a big topic of conversation in our household (not just any purses, by the way .... we're talking BIG purses ... Very BIG purses). They don't really make sense to me. I speak for the entire male species when I say that very big purses are beyond our intellectual capacity. If it doesn't fit in our pockets, it wasn't meant to leave our houses. For me ... Even a comb sometimes is difficult to manage. I can lose a comb a week. 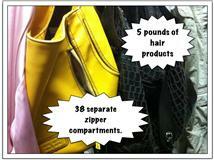 How many hair products, cosmetics, change purses and pill bottles do you need with you at all times? It's as if my wife, Debbie, feels like we might be evicted from our house when we leave ... so she better be prepared. I get the fashion statement thing. But we have all seen 4 foot tall women hauling 5 foot tall bags ... and 6 foot tall women carrying little sparkly purses. Maybe it's me ... but something's wrong with that picture. In my opinion, the bigger bags on little women do not make them look taller. And the little bags on big women ... well ... that's a whole different story. 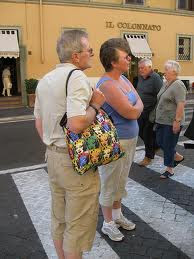 Maybe one day it will all make sense ... when I'm 80 and waiting for my wife at the store dutifully holding her bag ... while she shops ( for more purses). You sound just like my husband! He just doesn't understand...you just never know what you might need! May as well make it look pretty! I'm 5'9 so I always avoid small purses. I took a trip this past weekend and used my humongous purse as a second suitcase. I would have been perfect on Let's Make a Deal. "Does anyone have a turtle in their purse?" "Oooo! Oooo! I have a turtle in my purse!" My husband calls my bag the 'Tardis.' It's not evden that big, but I can never find anything in it. Things go in...but they never come out. I apparently need a Part 2,3,4 for this topic. Maybe even a husband support group page. Do I Feel Hot To You?